Call performance dashboard in Salesforce. RingInsights is a complete call performance dashboard built into Salesforce that uses all the call data that Ring.io automatically logs into Salesforce. RingInsights gives managers visibility into how their team is performing over the phone with actionable metrics that they can use to improve their team. Track the best time for your team to make calls. Know what days and times your team makes the most calls. Understand what percent of your calls lead to demos and meetings. RingInsights uses all of the data that Ring.io pushes into Salesforce to give you deep insights into your sales team's performance, productivity, and effectiveness. RingInsights is a native Salesforce dashboard that uses RIng.io's data. 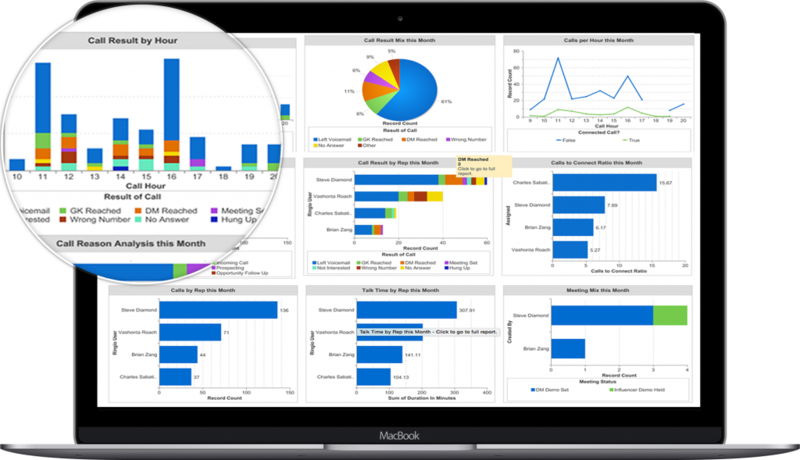 This means that you can extend the dashboards to fit your own needs and sales process.